Not every Orbitor One pinball machine made by Stern had the speech board installed. To reduce its selling price, this board was optional. It seems most games shipped to Europe were shipped with only the SB-300 sound board. The speech board could be bought by operators from Stern as an optional kit. Adding an VSU-100 speech board to my Orbitor One pinball machine was something that was already for a few years on my 'to do' list. My Orbitor One (well, actually my second one which I still have, my first one did have one installed) did not have it. 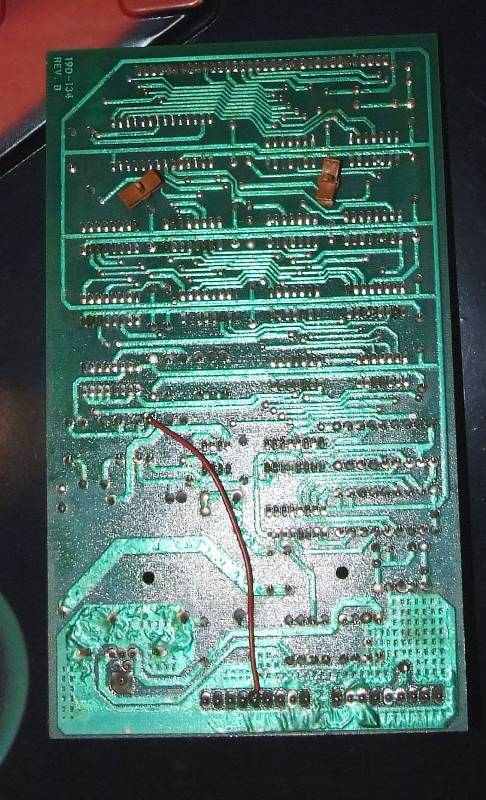 Problem was that I had once read on rec.games.pinball that if the game didn't have to board, it probably also didn't have the correct wiring for it, so it would not be an easy task like just plugging it in.. I already had for a year or so the board around, out of a Stern Flight 2000, but didn't have all the wiring to connect it to the lamp driver board. Recently I acquired a Stern Freefall that I was going to part out. 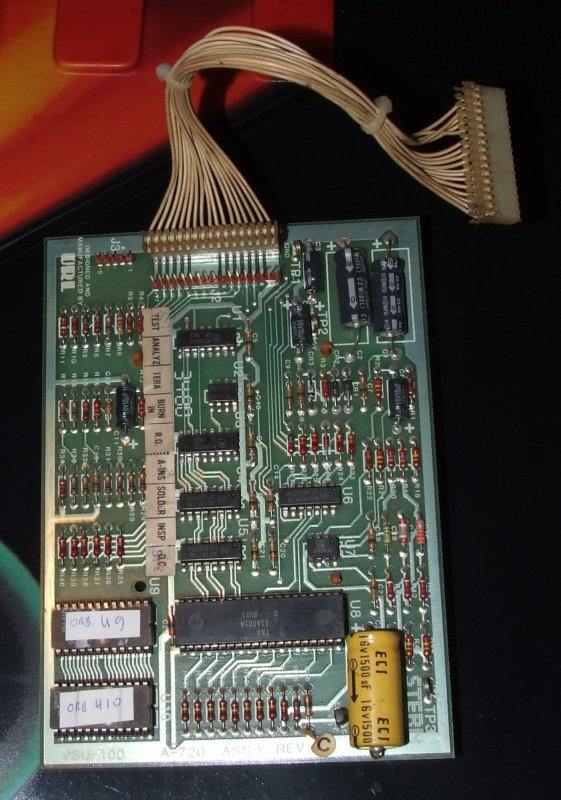 That game also have the correct sound and speech boards with intact wiring. Time to finally start this project, as in worst case I could probably use part of the wiring harnass out of the Freefall. Turns out it was a much easier task than I expected.. I should've started this project a long time ago already ! Here's a view of the backbox. On the left side at the top there's the SB-300 soundboard. At the bottom is an empty space where the VS-100 speech board should go. Note I put a piece of cardboard against the metal ground wiring, so not to make a short with the board temporary wired up. Later I will take the correct mounting plastics out of the Freefall backbox. 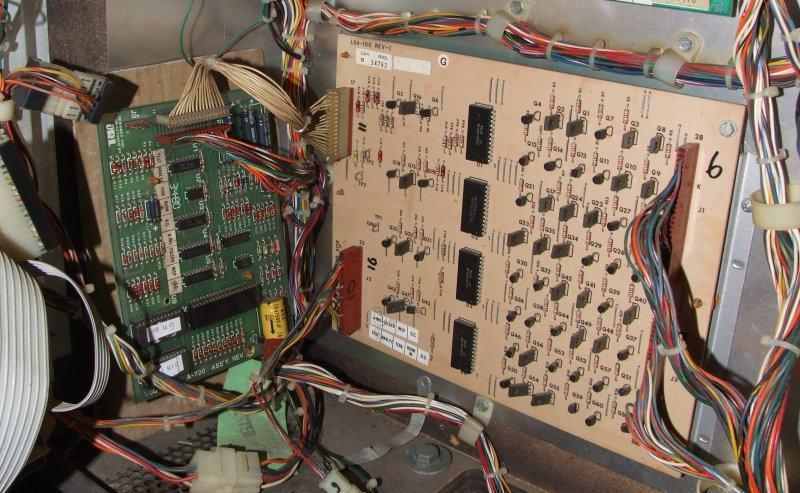 At the top right there's the mpu-200 board, bottom right in the picture is the lamp driver board. Imagine my surprise when I started to look around in the backbox and found out that the required connector for J3 on the speech board was present on my game ! 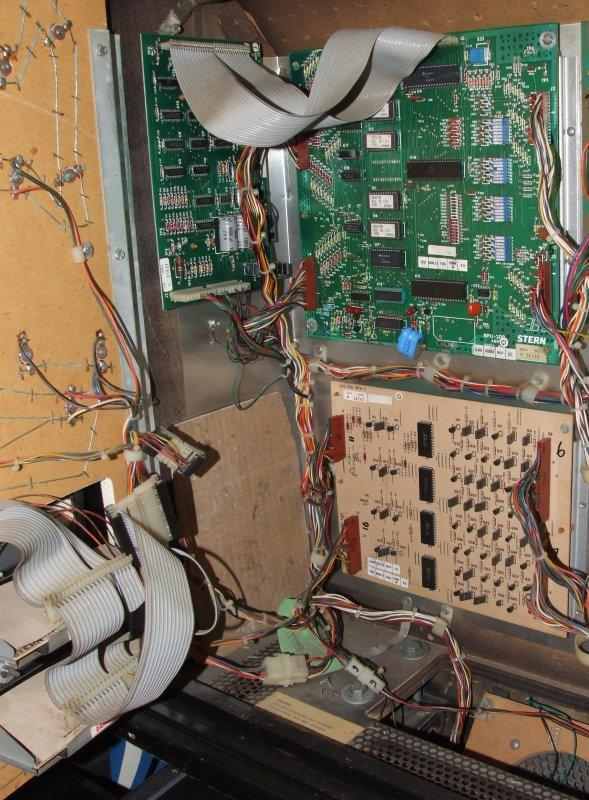 I guess it was installed on every Orbitor One made, but is very nicely hidden away within the other wiring loom. It ran to the bottom of the game, inside/behind other wires. Only by removing the plastic clips that hold the wiring loom I discovered this connector. Anyway, now I knew this connector was present, the most difficult part of this modification was solved. 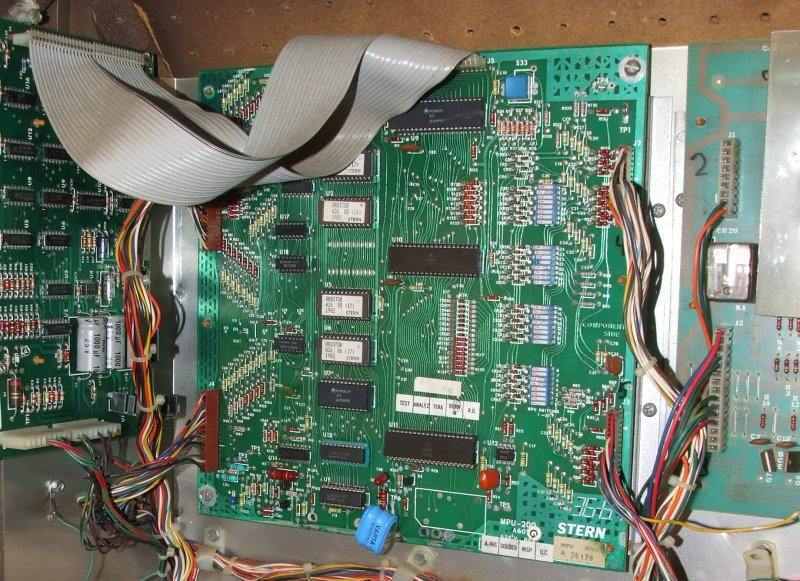 A Stern VS-100 speech board. You also need the extra cable to connect it to the lamp driver board. If you do not have this flatcable, you can make it yourself, all pins match on both ends of the connector (but always check schematics to be sure what you are doing). I used the VS-100 board out of the Freefall. For testing you can leave the eproms in, but they are game-specific so you need to buy (and install) U9 and U10 for Orbitor One. A little pinball trivia/history: seems this board wasn't designed by Stern themselves but by a company 'URL' ? Seems this was a separate company startup by a group of engineers that was bought by Stern. Now you still have the board out, it's probably a good idea to replace the capacitors. They're old and installing new ones will improve how the game sounds. Replace the large yellow one at the bottom and the 2 at the top corner. Also replace the capacitors on the soundboard. You can buy a kit for this SB-300 board at Great Plains Electonics. From now on installation was easy.. Install the VSU-100 speech pcb. 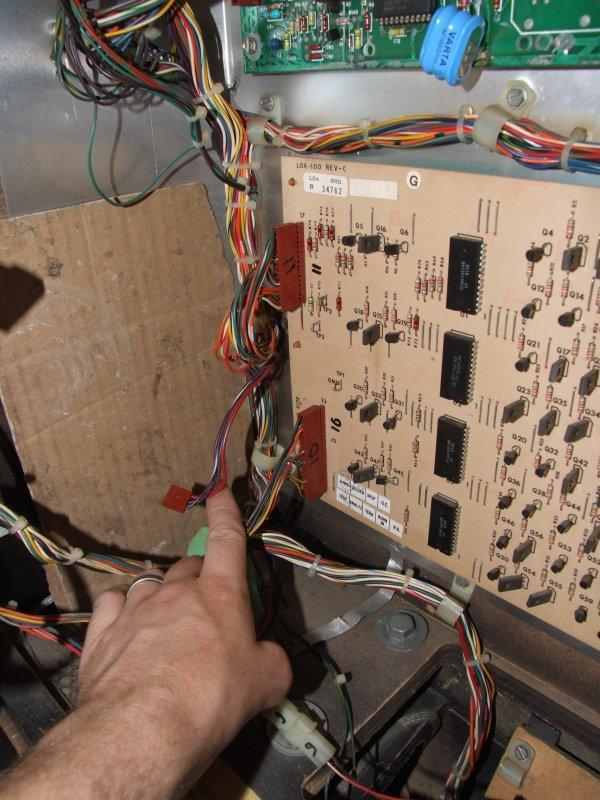 Unplug the connector to JP4 (top left) on the lamp driver board and connect it to either JP1 or JP2 on the speech board. Both are linked so it shouldn't matter if you use one or the other. Using the extra cable you connect the speech board back to the lamp driver board. Connect the small connector you found in the wiring loom to J3 on the speech card. I still don't hear any speech. You have to activate it ! To do so, set Dip 17 to ON. On the mpu board the dip switches are numbered from the bottom to the top, so it's the bottom switch on the third dip switch bank (counting from the bottom) you have to switch to on. This will enable speech on the mpu board. Now the game should have speech enabled. If you run the solenoid test it will already play some sample sounds. It will also speak to you at the beginning and end of a game, and when you lock a ball or start multiball. Nothing very spectacular, but it really was nice to finally hear Orbitor One talk to me after having the pinball machine all these years in my gameroom with sound only. If you still don't have any speech now, check what revision of SB-300 sound board you have. Both boards I had out of the Flight 2000 and Freefall were revision E, and they had a jumper added in the back to enable speech. My Orbitor One had an SB-300 revision I installed, there this jumper was not necessary. So depending what revision it is (it's labeled on the front), you may need to add this jumper wire. It goes from J3 - pin 5 (4 is key) to the top of C14 (top is marked with a + sign on the pcb). I assume all Orbitors shipped with the latest board at the time (which is ready for speech), but you never know during its lifetime the boards were swapped with these from an older game..